Your furniture is as important to a room’s appearance as your carpet. Every once in a while you might notice a spot on your upholstery and try using a household upholstery cleaner, right? It’s quick, it’s easy and sometimes, it might work. But what happens when the stain doesn’t come out? Even when stains are not visible, upholstery carries bacteria, mold, dust and mildew that, if not removed, can potentially affect your health. Furthermore, if you can’t see any visible stains, does that really mean your upholstery is clean? Not necessarily. 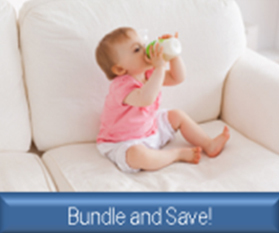 Upholstery is made of different fibers and the cleaning products used are not the same as your carpet solutions. Holding an IICRC S300 Upholstery Certification, we will inspect each fabric and use the best solution to clean it. Our services include professionally steam cleaning and we offer deodorizing, sanitizing and fabric protection at an additional charge. Also, did you know that Budget King cleans auto upholstery? Check out our testimonials and read what Tom in Elmhurst had to say about our services. But before you do that, call Budget King today at 630.543.0668 to schedule your upholstery cleaning! Draperies are some of the most visible elements in your home or business so you want to make sure they are looking their best at all times. After months of exposure to dust, cooking or tobacco smoke residues and other environmental pollutants, your draperies and valances will need to be professionally and thoroughly cleaned, usually every few years. Of course environmental circumstances and other factors vary, thereby affecting the recommended cleaning interval. Nevertheless, the investment you have made in your draperies is worth protecting. So whether you are spring cleaning, moving or just want to freshen up your draperies, call Budget King at ­630­.­543­.­0668­ for an appointment. We will take down, professionally clean and reinstall your draperies and valances. Mattresses are something you use constantly, but seldom get cleaned. In fact, one-third of your life is spent in bed. In order to prolong the life of your mattress and eliminate mold, bacteria, allergens and other organisms, regular cleaning is essential to improve your mattress lifespan. Call Budget King today at ­630­.­543­.­0668­ to schedule your mattress cleaning. Our low-moisture, high-pressure system will clean and dry your mattress in the same day. You’ll sleep better. At Budget King we have been providing cleaning services to the Chicago area for years. We separate ourselves from our competition by providing fast, quality service at competitive prices that fit your budget. 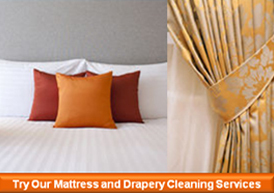 If you need your upholstery, mattress or draperies cleaned, call us today at­ ­630­.­­543­­.­­0668­. Credit cards are accepted. You’ll remember only how good your home or business looks after our services.